Depicts: Image as seen in the Rover Inspection Mirror of PanCam. Image as seen in the Rover Inspection Mirror of PanCam. PanCam is supplemented by a 5-cm diameter calibration target and by a small spherical mirror, the Rover Inspection Mirror, which enable the camera to capture images of every angle of the Rover. The images taken are then processed and can be used to check the status of the Rover. 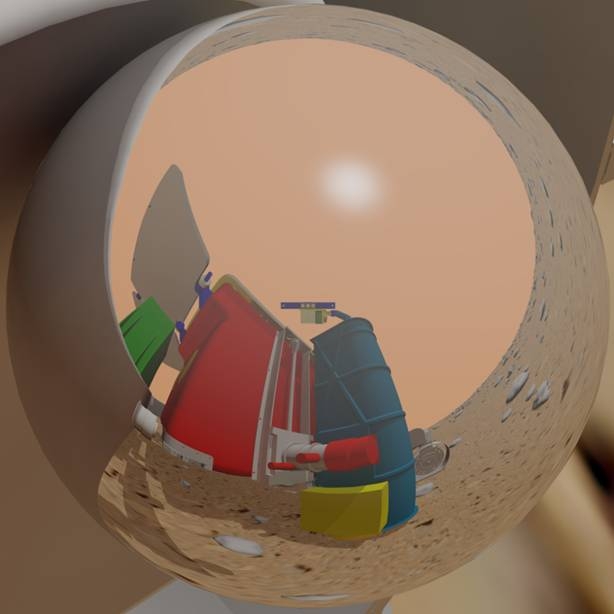 This image shows a sample of the Rover Inspection Mirror view which will then be flattened to have a clear view on specific parts of the Rover.